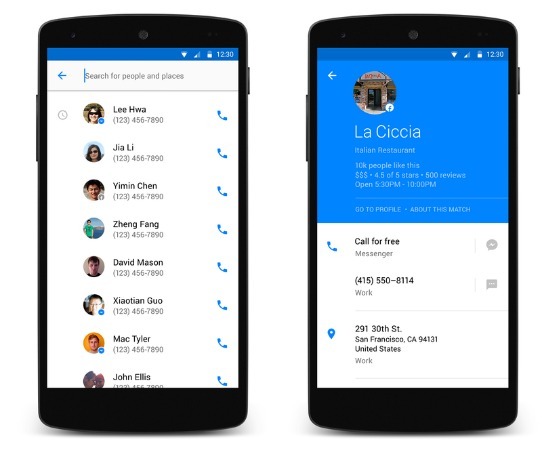 Hello combines a dialer with an interface for viewing contacts, along with easy call blocking and seamless search for people and places. The search part feels especially well tailored for queries relating to businesses. You just need to type a few letters of the name, and if that business has a Facebook page you’ll then be able to call it with one tap (if it has a phone number listed on Facebook itself, of course). The same process also works for people, as you’d expect. You can message contacts using Facebook Messenger, and even call them via VoIP using Messenger’s dedicated feature. But the main thing Hello does is take over when a call comes in, which is where it shows you information about people even if you don’t have them in your contact list. This is obviously powered by Facebook’s vast database of people and phone numbers. The photo that shows up is the person’s Facebook profile picture, and some additional details are shown on the call screen too – for example, if it’s someone’s birthday. Hello offers to automatically block numbers that have been blocked by a lot of other people, but you can also manually block any number in a very simple way. Since the app ties into Facebook, contact information such as profile pictures and birthdays always stay up to date. And like with the dialer and contacts apps built into Android, Hello lets you add and edit contacts too.